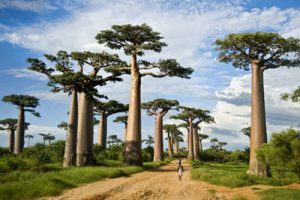 The baobab trees belong to the genus Adasonia and are native to arid environments. The most widespread species is the Adasonia digitata, which is native to the African continent. From the fruit of this plant, a powder is made that has become fairly common in the dietary supplement trade. On average, Adasonia digitata powder – often referred to simply as baobab powder – contains modest amounts of carbohydrates and low amounts of protein and fat. There are also modest amounts of riboflavin, calcium, magnesium, iron, and phytosterols, and it is a pretty good source of phosphorous, potassium and vitamin C.
The vitamin C content vary a lot from one baobab powder product to the ntext, with some tested supplements containing less than 75 mg per 100 grams and others containing over 160 mg per 100 grams. As a comparison, 100 grams of the fruit orange contains just over 50 mg of vitamin C.
Baobab dried fruit pulp was authorized as a safe food ingredient by the European Union authorities in 2008, making it legal to offer it commercially within the union. Later that year, it was granted GRAS (generally recognized as safe) status in the United States. In Zimbabwe, the fruit pulp is crushed and stirred into porridge and drinks. The fruit is also eaten fresh. In Angola, the fruit is boiled to make a drinkable broth. The broth also serves as the basis for an ice cream called gelado de múca. On Madagascar, the fruits of A. grandidieri and A. za are eaten fresh, and the taste is commonly likened to that of sorbet. In Tanzania, the fruit pulp is dried and added to the sugarcane liquid when making beer. It is said to aid the fermentation process. The seeds of some species are a source of food oil. The leaves are some species are eaten as a leaf vegetable. Indigenous Australians have a tradition of making string from the root fibres and decorative crafts from the fruits.